UPDATE: The campaign to save our future Elphinstone Park has come to head in the Twist and Shout forest area thats been slated for logging. 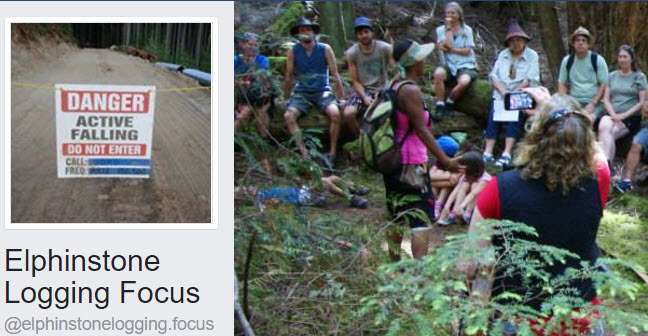 On Tuesday, August 16th, Peninsula Logging Ltd. accompanied by BC Timber Sales, showed up at the Forest Protection Camp and attempted to break through our 3 month old roadblock to begin falling. Our campers stood on the road and prevented them from proceeding. The RCMP were in attendance to help foster peaceful communication between all parties. Peninsula Logging may choose to go to court and apply for an injunction to force the roadblock to come down. ELF will have our lawyer present to defend the forest from destruction. This could happen in days or in coming weeks. In the meantime, in response to our complaints to the BC Forest Practices Board about the threats to this blue-listed (at risk) ecosystem, the Min. of Environment is bringing in a biologist to study the area. WHAT YOU CAN DO: ELF calls out to each supporter to meet this Sunday Aug. 28, 1pm, to participate in a photo of us all forming a human link around part of the Twist & Shout area. It will be symbolic of the community support for protection of this key forest in the centre of the park expansion area, and will be made public. Drive, cycle, or bus and walk to the powerlines, 1 km up the B&K Rd (Largo) at 1pm Sunday. From there we’ll transport and drive up together another 1.5 km on the car friendly B&K to the protest site. Allow 2 hours total time. Thank you for your community support in helping to create an expanded Mt. Elphinstone Provincial Park. ← Help save Mount Elphinstone’s endangered forests and write your letter today!